London, August 6 2018: V.Group, the leading global marine and offshore vessel management and support services provider, today announced the launch of its groundbreaking Fleet Cell of the Future, a prototype for the future of technical management and marine support services. This new design of operation rethinks and redesigns the traditional Fleet Cell model, the building block of technical management at V.Group. With market-leading performance design and an open-plan layout based on the latest in ergonomic research, it enables a shift away from single user focus to full team problem-solving. 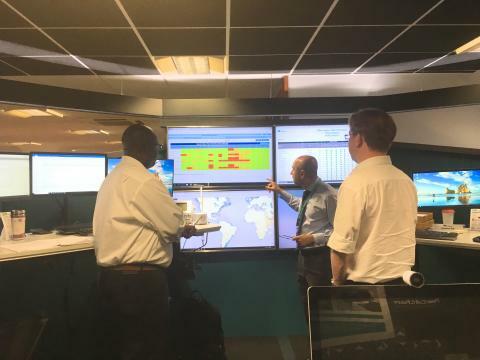 The Fleet Cell of the Future acts as a test bed for innovations, where the technical management team can measure operational, financial, and customer KPIs for the Fleet Cell and measure the effectiveness of new approaches and technology, based on agile processes. By adopting this new approach, V.Group has already seen significant improvements in the operational KPI’s for procurement, certification, defect reporting and application of best working practices within an existing Fleet Cell of 17 vessels. There are more innovation initiatives in the pipeline, as well as an increased number of potential innovative partnerships. These tangible results are testament to the fact that every facet of innovation in the creation of the Fleet Cell of the Future has been designed around what will deliver a measurable impact for V.Group’s customers. Every aspect of the project has been designed to ensure quicker communication and recall of data between the Fleet Cell and crew, as well as within the Fleet Cell itself. “Digital transformation isn’t about giving everyone an iPad, putting giant screen on a wall to make a room look like a NASA control room, or creating an app and saying job done,” says Jon Key, director of strategy, innovation and transformation at V.Group. “We’re looking at how people talk to each other, work together, and solve problems for our customers as a team. Little things, like stand-up meetings every day and giving everyone in the cell the permission – and responsibility – to solve problems, can have far more impact than a new piece of tech. The Fleet Cell of the Future forms part of V.Group’s growth strategy under its innovation pillar, enhancing customer and colleague experiences and operational efficiency. It builds on V.Group’s history of innovation, with numerous firsts over the years and 46 innovative programmes across the business. V.Group’s groundbreaking Fleet Cell of the Future utilises new ways of working, combining people and technologies to help the company to transform the industry as the leading provider of marine support services.